Mr. Natcharat Packul and a permanent professor in the Department of Food and Nutrition, Faculty of Home Economics at RMUTT have invented sugar-free ice-cream made of wheatgrass and jasmine rice leaves as a means of adding nutritional value, by using jasmine rice that has been germinated after harvest due to its high chlorophyll and antioxidant content. 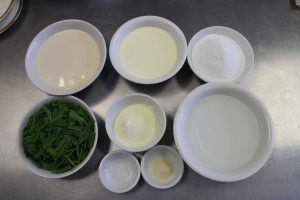 He also used maltitol, a sugar alcohol that provides low energy, as a sugar substitute in the ice-cream. Mr. Natcharat Packul said that jasmine rice is the most famous variety of rice in Thailand, largely grown in the northeastern and central regions of Thailand. 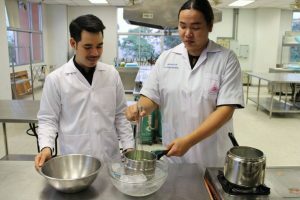 Besides the chewy and soft texture, jasmine rice also gives off an aroma similar to jasmine flowers, which is why consumers tend to like jasmine rice. 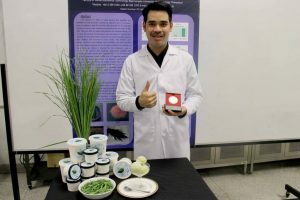 However, the price of rice in the current market is not as well off as it should be. 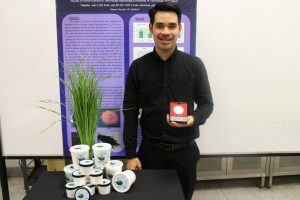 Thus, he decided to help farmers by inventing a product made from rice. 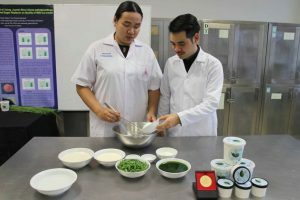 Jasmine rice is commonly used to create nutritional value in food, which can be observed after it has been harvested as it will start to regenerate from the original plant. 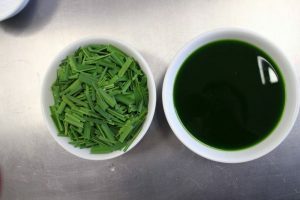 It also has a high chlorophyll and antioxidant content, and a unique aroma and color. 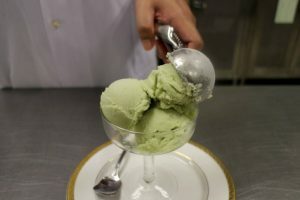 Moreover, while ice-cream is widely consumed and contains high energy, fat, and sugar content, Mr. Natcharat Packul used maltitol, a sweetener in the sugar alcohol family, which has a taste and sweetness similar to sugar, as a sugar substitute in the ice-cream since it provides low energy, containing merely 2.1 kcal, if compared to regular sugar consumption of up to 4 kcal. 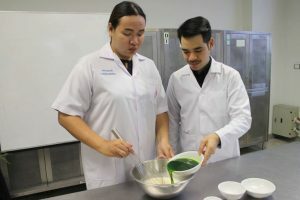 Microorganisms are not able to use maltitol as food, causing no tooth decay as well. 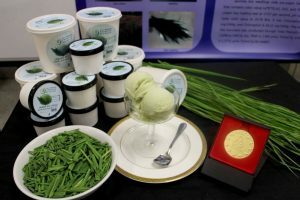 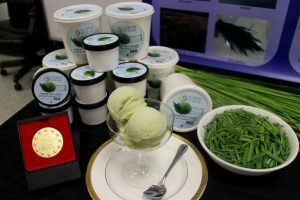 Additionally, to add value to ice-cream by using other parts of the plant that may not be consumed, he used wheatgrass and jasmine rice that has been harvested, as ingredients. 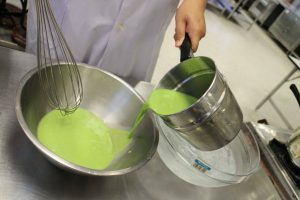 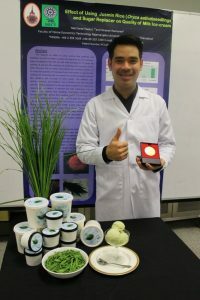 Sugar free ice-cream made of wheatgrass and jasmine rice leaves has received a gold medal in The 6th World Exhibition on Inventions, Research and New Technologies, held at Brussels Innova, Belgium in 2016, in which 4,000 researchers from 20 countries have submitted more than 300 inventions. 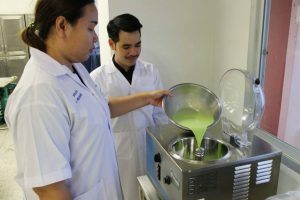 Those that are interested may ask for more information by contacting Mr. Natcharat Packul at 089-252-1300.